BeneCom℠ Corporation is a benefits communications consultant and enhanced benefits expert. That’s because we have been communicating benefits for over 22 years. Open enrollments are our spotlight – an event that we help oversee and plan, for the best possible results with little to no cost to you as an employer. Most of our work is done in partnership with a company like yours. As your company's benefits communicator, your expertise is helping your employees by offering choices, and ours is to maximize the success of those plans. We do this through our benefits communication and experience of taking all the information and relaying it in a way that all your employees understand what is available and how these plans work. Flexible spending accounts can be added through the BeneCom℠ Corporation relationship with Wageworks. FSAs enable employees to put aside pre-tax dollars for certain out-of-pocket expenses they already plan to spend during the year. 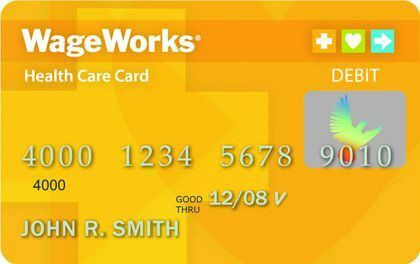 We offer the "take care®" Debit Card — the single card solution, simplifies how participants pay for one or multiple benefits expenses. Participants won't have to pay qualified expenses with personal funds and then wait for reimbursement from their Flex benefit account. The IRS amended the use-or-lose rule to allow a limited amount of unused funds to rollover at the end of the plan year. Although the IRS notice calls it “carryover”, we call it “rollover”. Up to $500 in unused funds can rollover into the following plan year. While your employer may elect to allow less the $500 to be carried over, the same rollover limit applies to all plan participants. Does the new rollover rule apply to Limited-Purpose or Post-Deductible FSA’s? Yes. Under IRS guidance, the new rule applies to all Health FSA’s. Does the new rollover rule apply to Dependent Care FSA’s? No. Your dependent care FSA is independent of this Health FSA ruling and remains unaffected. If rollover is offered, doesn’t this change the $2,550 maximum annual election? No. For example: If the full $500 were to rollover into the following plan year and you elected to contribute the full $2,550 (must be a minimum of $100) in that year, you would have a total of $3,050 available for reimbursement of eligible healthcare expenses that year. Does my rollover FSA affect my eligibility to participate in a Health Savings Account (HSA)? Does the rollover option affect the run out period? No. You will still be able to file claims during the run out period for expenses incurred during the plan year. This will be useful if you have more the $500 in your Health FSA account at the end of the year. Check your plan document for the length of your run out period. Once all run out period claims have been processed for reimbursement your rollover funds will move into the new plan year. Do I have to elect a health FSA in the plan year into which funds are rolled over? Yes. You must make an active election of a minimum of $100 in order to take advantage of any carryover funds you have remaining in the previous plan year. How does the rollover apply to a short plan year? Rollover of funds for a short plan year is allowed. How is the rollover amount calculated? The carryover amount is determined after all expenses have been reimbursed for that plan year (after the end of the plan’s run out period). For example, if a plan has a run out period that ends on March 31 of the following plan year, the amount rolled over for a plan year is equal to the amount from that plan year remaining in the participant’s Health FSA after March 31 (up to the rollover amount elected by the employer, but no more than $500). Any unused amount in excess of $500 (or, if lower, the carryover amount elected by the employer) is forfeited. How long do I have to use my rollover funds? According to the IRS ruling, “The carryover of up to $500 may be used to pay or reimburse medical expenses under the Health FSA incurred during the entire plan year to which it is carried over.” The expense must be incurred by the last day of the plan year into which the funds were rolled over. However, if you terminate employment, then you are only eligible for reimbursement for claims with dates of service on or before your termination date. In what order are funds utilized for new claims? According to the guidance examples, current year funds should be used prior to any rollover funds being used. Can I use my benefits debit card to access rollover funds? Yes. Once all run out claims are processed for payment all rollover funds will be available on the debit card. What happens to the rollover if my employment is terminated? If you leave the Company mid-plan year, you are not eligible to receive rollover funds, unless you elect COBRA. However, you have a run out period to submit claims within the dates of service for which you were eligible for reimbursement. At BeneCom℠ Corporation, we go above and beyond what typical brokers and consulting firms provide in the way of benefits enrollment and communication. We understand in today's environment with Health Care Reform and ever-growing confusion, that education is the key to unlocking the value of voluntary benefit programs. That is why BeneCom℠ Corporation tailors an enrollment strategy to fit your company's needs and we commit to providing a personalized and professional benefits communication experience for your employees when it comes to core or voluntary benefit offerings. By implementing such valuable corporate services we assist in broadening your employee options while at the same time simplifying your internal processes. We do all of this with the most talented people, the latest technology, and with a true enthusiasm for advancing your business goals.